This policy brief is one of five commissioned by the Department of Health and Human Services, Office of the Assistant Secretary for Planning and Evaluation on Medicaid eligibility policies for long-term care benefits. 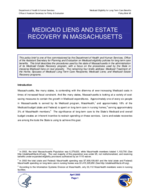 This brief describes the procedures used by the state of Massachusetts in the administration of its Medicaid Estate Recovery program, with a focus on the procedures used by the State in imposing Medicaid liens on real property. The remaining four briefs address: Medicaid Treatment of the Home; Spouses of Medicaid Long-Term Care Recipients; Medicaid Liens; and Medicaid Estate Recovery programs. Massachusetts, like many states, is contending with the dilemma of ever-increasing Medicaid costs in times of increased fiscal constraint. And like many states, Massachusetts is looking at a variety of cost-saving measures to contain the growth in Medicaid expenditures. Approximately one of every six people in Massachusetts is served by its Medicaid program, MassHealth,1 and approximately 18% of the Medicaid budget (state and Federal) is spent on long-term care in nursing homes,2 serving approximately 3% of MassHealth members.3 The significance of long-term care to the States Medicaid and overall budget creates an inherent incentive to restrain spending on these services. Liens and estate recoveries are among the tools the State is using to achieve this goal. Current Medicaid regulations in Massachusetts6 require recovery from the probate estates of MassHealth members who received Medicaid while age 55 or over and those who, regardless of age, received Medicaid while institutionalized. All MassHealth expenses incurred for such members, with certain exceptions7, are counted toward the total recovered amount. An exception from estate recovery is made in cases where recovery would cause hardship,8 and only partial recovery is required from the estate of members who had long-term care insurance policies that met the Massachusetts Division of Insurance requirements.9 Estate recovery is deferred while there is a surviving spouse or child who is blind, permanently and totally disabled, or under age 21. The institutionalized member is expected to return home within 6 months. The lien gives the State authority to recover Medicaid payments that have been made if the property is sold while the member is alive. Only partial recovery is required from property owners who have long-term care insurance policies that meet the Massachusetts Division of Insurance requirements. Further, recovery is deferred during the members lifetime if a sibling or adult caretaker child is living in the property14. The deferral lasts as long as these relatives live in the property and it ceases to apply once the member dies. In Massachusetts, the living lien process is initiated at one of four regional MassHealth Enrollment Centers, which are responsible for Medicaid eligibility determinations. At these offices, workers who perform eligibility functions are assigned to teams, where they function as either intake or ongoing workers. Intake workers process applications for persons aged 65 or older and persons of any age needing long-term care.15 Ongoing workers perform periodic re-determinations and case maintenance activities for these populations and for MassHealth members who are under 65 and not institutionalized. Most workers are college graduates who must pass a civil service examination as a condition of employment. They receive extensive on-the-job training in all facets of eligibility determination and the estate recovery/lien processes, as well as continuing education on new state regulations and procedures. Team managers evaluate the workers skills on an ongoing basis, and recommend remedial training whenever necessary. Intake workers are randomly assigned applications by a computerized program and are responsible for all activities associated with the application until they make a determination of eligibility. Upon receipt, they review the application to see if there is information requiring further verification. They also determine if the applicant owns any real property that may be considered a countable asset or on which the State may place a living lien at a later date. If the applicant indicates he or she does not intend to return home, no lien is placed against the property, which is then regarded as a countable asset for purposes of the Medicaid eligibility determination. However, its value is disregarded for up to 9 months, provided the applicant/member signs an agreement to sell the property21 for fair market value. If the applicant/member indicates he or she intends to return home, and a protected relative does not live in the home, a form22 is mailed to the applicants physician asking if there is a reasonable expectation that the applicant will return home within the following 6 months. If the physician answers affirmatively, no further action is taken at application. However, an ongoing worker will review the members status after 6 months and, if the member is still institutionalized, ask his or her physician to fill out another form that indicates if there is a reasonable expectation that the member will return home at that time. If the physicians assessment is that the applicant is not expected to return home within 6 months, a notice23 is mailed to the applicant that restates the Medicaid lien rules, regulations and exemptions, and informs him or her that a lien will be filed unless the determination is appealed.24 Once all other conditions of eligibility have been met and the application for Medicaid is approved, the MassHealth Lien25 and a copy of the deed are sent to the Lien Coordinator at the States Estate Recovery Unit. The Estate Recovery Unit (ERU) is staffed by the Center for Health Care Financing (CHCF), a unit within Commonwealth Medicine, a consulting division of the University of Massachusetts Medical School. CHCF works with state and local government agencies to identify ways to increase the value of healthcare expenditures while reducing the net cost of health care service delivery. ERU staff are all professionals -- attorneys or paralegals26 -- with backgrounds in real estate law, probate law, and/or Medicaid and estate planning. Staff regularly attend professional seminars and take courses to update their knowledge of current real estate and probate law.27 In addition, the Estate Recovery Unit contributes to the training of enrollment center workers by periodically updating current information on the estate recovery process, while reinforcing workers' roles in this process. Recovering all monies in compliance with state and Federal statutes. It is important to note that, although Medicaid gives states authority to place post-death liens, in Massachusetts a lien is only filed while the member is still alive. A lien is never placed on any kind of property -- real or personal -- once the member has died. After the member's death, the Estate Recovery Unit will recover MassHealth costs from the member's probate estate. A probate estate includes property that a person possesses at the time of death and that descends to the heirs (with or without a will) subject to the payment of debts and claims. The probate estate may include real property on which a living lien was filed. However, the lien is no longer valid after the member's death and must be released upon the request of the administrator/executor. After intake workers at the enrollment center determine that an applicant/member owns property subject to placement of a living lien, they send the lien and the deed to the Lien Coordinator of the Estate Recovery Unit, who is responsible for filing all living liens at the appropriate Registry of Deeds.29 The lien is recorded in the county and district where the real estate is located. In FY 2003 (July 1, 2002 to June 30, 2003), 665 living liens were filed.30 During that same time period, applications for MassHealth were approved for approximately 6,500 institutionalized persons.31 If a deed is not attached to the MassHealth Lien,32 the Lien Coordinator will attempt to access the deed on the website of the Registry of Deeds and verify the accuracy of the information (spelling of name as recorded on the lien, address, deed book and page number, etc.). The Lien Coordinator then waits at least 30 days before taking further action to allow the member (or members family) to appeal the intent to place a lien. If the action is appealed, the Lien Coordinator will wait until notified of the appeal decision by the Board of Hearings. When the 30 days have passed, the Lien Coordinator will verify that the real estate has not been transferred33 and the member has not died before recording the lien at the Registry of Deeds. Once the lien is filed, the Lien Coordinator enters the case on the ERU database with a status of open lien inactive. The Lien Coordinator also follows up with the Registry of Deeds on-line to ensure that the lien has been properly and accurately recorded (faulty recording can prevent recovery at a later date). Presence of the lien will prevent sale or transfer of the property until the Medicaid claim is either paid or the lien is released without payment. After the living lien is properly recorded, no further action is necessary until there is a need to release the lien. The release may or may not trigger recovery actions, depending on the circumstances. New information is provided that an exempting relative resided in the property -- 0 occurrences. Massachusetts regulations require long-term care facilities to send a written notice36 to the Enrollment Center when a member is discharged from the facility for any reason. If the centers ongoing workers learn of any other changes in the circumstances of a member from his or her family that might impact an existing lien, they will request whatever supporting documentation is needed to confirm the changed circumstances. Usually this consists of verifying the family relationship of an exempting relative or the duration of residence in the members home. Having received verification of the members changed circumstances, the ongoing worker completes an Authorization to Release a MassHealth Lien37 and sends the form and applicable verifications to the ERU Lien Coordinator. In the case of a permissible transfer of property, the ongoing worker will also send a doctor's note (if applicable), proof of residency, and a copy of the recorded transferred deed. The Lien Coordinator then releases the lien from the property at the Registry of Deeds and updates the ERU database to indicate that the lien has been released. A copy of the release is forwarded to the Enrollment Center. Although no recovery is made at this point, the estate may still be subject to recovery at the time of the members death. There are two circumstances under which a living lien is released following recovery of the Medicaid claim -- when the property is sold or transferred, or the property is refinanced. Both of these occur while the member is still alive. The Estate Recovery Unit is contacted, usually by an attorney, when a potential buyer or mortgagor discovers a Medicaid lien on a property during the title search. ERU staff then order a medical billing history report from the State's Medicaid Management Information System (MMIS). All MassHealth expenses incurred after April 1, 1995, with certain exceptions,38 are counted toward the total claim. If the member has long-term care insurance, indicated by a code on the MMIS Third Party Liability screen, long-term care services are also subtracted when calculating the total claim amount. The attorney is asked to provide information on the current assessed value39 of the property and is informed as to the amount of the claim. At a real estate closing, the amount of the lien is indicated on the HUD Settlement Statement. It must be paid as a condition of sale or transfer. If the lien amount is greater than the sale amount, a reduced amount will be accepted to satisfy the lien. The order of payment of debt is established under Massachusetts General Laws.40 Mortgages, taxes, amounts due to public utilities, and child support arrears are paid before the Commonwealths lien and may further reduce the amount that is actually recovered. Massachusetts uses the living lien to prevent MassHealth members from giving away the home in which they no longer reside before its equity can be used to offset long-term care expenses paid on their behalf. The number of liens released with recovery represents only a small amount of total dollars recovered and claims settled in FY 2003. The lien is released when the Estate Recovery Unit receives a settlement check. The Estate Recovery Unit then forwards a copy of the release, the check, and the HUD statement to the Enrollment Center, where the members eligibility may be re-determined based on any net proceeds that may have been received from the sale of the property after satisfying all other claims. The Estate Recovery Unit may learn of a members death informally -- i.e., they may be contacted by the decedents family, nursing home, or Enrollment Center. Formally, Massachusetts law42 requires that a copy of any petition for admission to probate of a decedent's will or for administration of a decedents estate be provided to the Estate Recovery Unit, along with a copy of the death certificate, whether or not the decedent was a MassHealth member. If the member (regardless of age) was permanently institutionalized on or after March 22, 1991. The Estate Recovery Unit files a Notice of Claim43 with the Probate Court, and a copy of the claim is sent to the administrator or executor of the probate estate with a cover letter44 that outlines the laws governing estate recovery and the exceptions to recovery. The Estate Recovery Unit is legally bound to communicate only with the administrator/executor or estate attorney unless given permission by them to communicate with someone else. The administrator/executor has 60 days from the date the notice of claim was filed in the probate court to object to the validity of the claim or request a waiver or deferral of the claim (as shown below). The claim may be reduced or discharged entirely due to an objection to its validity. A deferral may be granted if there is a surviving spouse or dependent relative -- i.e., a child who is blind, permanently and totally disabled, or under 21 years of age. (The estate is given the opportunity to settle when the deferral is granted, but is not in any way coerced to do so.) The deferral will last until the death of the spouse or loss of exempt status of the dependent relative. A waiver may be granted if hardship is established. Documentation must be provided to demonstrate that all of the hardship waiver requirements45 have been met. If review by the Estate Recovery Unit indicates that these waiver requirements continue to be met during the following 2-year period, recovery is then permanently waived. If the validity of the claim is contested or there is a request for a waiver or deferral and satisfactory documentation is not provided to enable MassHealth to resolve the issue during that timeframe, the case is referred to the MassHealth Legal Division for resolution and, if necessary, court action to protect the claim. If the claim is not contested during the 60-day period (i.e., the claim is valid and no request is made to object to the validity of the claim, waive or defer recovery), the actual collection process is initiated, and payment is expected in full. If appropriate documentation is provided to prove that the estate contains insufficient assets to pay the claim in full, the Estate Recovery Unit will accept less than the full claim amount. In such cases the Estate Recovery Unit will request asset information to determine the value of all the assets owned by the decedent. There are two types of property in probate estates -- real property and personal property, the value of which is found on the Probate Inventory filed at the court. If the estate includes real property, the fair market value of the property must be established. The estate administrator/executor may do so by submitting copies of the current tax bill or most recent tax assessment showing the assessed value of the property and a written appraisal of the fair market value of the value from a knowledgeable source, such as a real estate broker, certified appraiser, or official from a bank or savings and loan association. Upon payment, both the claim and any living lien that had been placed on the members real property are released. If there was a living lien on the member's real property, the Estate Recovery Unit must release it after they have received notification of the member's death and a copy of the death certificate48. Generally the lien and the Notice of Claim are released at the same time. If an attorney representing the members estate requests release of the lien prior to settlement of the estate, the Estate Recovery Unit releases it, since a living lien is no longer valid when the member is deceased. However, in the absence of such a request, the lien is not released until the Estate Recovery Unit determines whether the members estate will be probated. If the estate is not probated within 1 year after the members death, the Estate Recovery Unit will forward a request to probate the estate to the Public Administrator in the county where the deceased member lived. Interest on the claim begins to accrue 6 months after the appointment of the estate administrator/executor at a rate of 12% per annum. On rare occasions, if the estate administrator/executor still refuses to settle the claim, the Estate Recovery Unit may file a motion in court to compel payment. Having adopted a Medicaid estate recovery program in 1969, Massachusetts has had ample opportunity to refine and streamline its decision-making and administrative processes. All recoveries are treated equally, and priority is not established based on the size of the claim. Up to $70 million in combined proceeds from estate recovery, casualty recovery, provider recovery, and drug rebate programs is deposited in the State's retained revenue account and is used to offset Medicaid costs. Proceeds in excess of the $70 million are deposited in the State's General Fund and are not designated specifically to offset Medicaid costs. Of the $28.8 million collected in 2003, $26 million (over 90%) was recovered from real property, although only about 41% of the total number of probate claims processed included real property.52 This supports the contention that the home represents a Medicaid recipients most significant remaining asset. Since July 2003 Massachusetts has debated proposed changes to its Medicaid estate recovery laws and eligibility rules for institutionalized persons. The first change would allow recovery from both probate and non-probate estates of MassHealth members. The second would allow implementation of an 1115 waiver proposal that would make it more difficult for individuals to qualify for Medicaid after transferring assets.53 Both proposals have been endorsed by the State's Republican Governor, Mitt Romney, who views them as a way to recover Medicaid dollars spent on behalf of MassHealth members at a time when the States rising Medicaid costs dictate the need for cutbacks in existing programs. However, the proposals have met opposition from the largely Democratic legislature,54 whose members have been deluged with the concerns of their constituents. New estate recovery regulations were promulgated in November 2003, and the State initiated recoveries from non-probate estates under the new rules until March 2004, at which time the legislature voted to delay enactment of the controversial law until July 1, 2004. In response to the March vote, the Estate Recovery Unit was forced to notify representatives for affected estates of the change, and to refund any monies collected from non-probate estates. Legislation subsequently submitted to repeal the expanded estate recovery provision was vetoed by the governor. On July 23, 2004, the legislature overrode the governors veto and amended Massachusetts General Laws58 to restore the original prohibition against recovery outside of probate. Unless the political makeup of the legislature is substantially changed and the concerns of advocates are alleviated, it is unlikely that Massachusetts will succeed in expanding its estate recovery program to include recovery from non-probate estates. Legislation has been adopted to allow MassHealth to submit the waiver proposal which, as of this writing, is still pending with Health and Human Services. However, as in the case of the estate recovery legislation, it can still be amended or rejected by the legislature in response to constituents' concerns. Despite their long history in the Massachusetts Medicaid program and protections afforded to MassHealth members by state regulations, liens and estate recovery remain controversial. They go to the heart of the fundamental and much debated question of how much should individuals be expected to pay for their own long-term care and how much should be financed by the taxpaying public. Statement of Intent to Return Home -- sent by enrollment center workers to determine if the institutionalized applicant intends to return home. The form explains that the home will be considered a countable asset if they do not intend to return there. Agreement to Sell Property -- sent by enrollment center workers to applicants who have indicated they have no intent of returning home. As a condition of MassHealth eligibility, they must sign this form, agreeing to sell their property in the following nine months. Statement of Expectation to Return Home -- completed by the applicants physician who must indicate if there is a reasonable expectation that the applicant will return home in six months. If the answer is no, a lien will be placed on the applicants home. Notice of Intent to Place a Lien -- sent to applicants by enrollment center workers when their physician has indicated they are not expected to return home in six months. The notice reiterates exemption rules for dependent relatives living in the home and also summarizes repayment/recovery rules. The MassHealth Lien -- completed by the enrollment worker and sent to the lien coordinator once the MassHealth application is approved. Status Change for a Member in a Long Term Care Facility or Rest Home -- completed by the Long Term Care provider and sent to the appropriate MassHealth Enrollment Center whenever a MassHealth applicant or member is admitted or discharged. Authorization to Release a MassHealth Lien -- completed by enrollment workers and sent to the lien coordinator when a filed lien needs to be released because the spouse or other dependent relatives live in the property or the property was permissibly transferred. Release of MassHealth Lien -- completed by Estate Recovery Unit staff who effect the release of the lien without recovery after having received the Authorization to Release form from the enrollment center worker. This form is also used to release the lien after claims have been settled either during the member's lifetime or during the probate process. Notice of Claim -- completed by Estate Recovery Unit staff and filed in Probate Court. The Notice of Claim indicates the amount that will be claimed from the estate based on MassHealth payments made on behalf of the decedent. Notice of Claim Cover Letter -- sent by Estate Recovery Unit staff to the administrator/executor of the estate along with a copy of the Notice of Claim. The cover letter explains the process that must be followed if the estate wishes to dispute the validity of the claim or request a deferral or waiver of repayment. The complete Appendix is available in PDF form at: http://aspe.hhs.gov/daltcp/reports/MAliensA.pdf. In 2002, the total Massachusetts Population was 6,379,620, while MassHealth members totaled 1,103,700 (See http://statehealthfacts.kff.org). The vast majority of this population was under 65, not institutionalized, and receiving benefits under expanded eligibility provisions authorized by an 1115 waiver. In 2002 the total (state and Federal) MassHealth spending was $7,909,109,661 and the total (state and Federal) MassHealth spending on long-term care in nursing homes was $1,415,305,950 (See http://statehealthfacts.kff.org). According to the Information Systems Division at MassHealth, only 33,112 MassHealth members were in nursing facilities. Information regarding the procedures discussed in this brief was obtained from two operational divisions of MassHealth, the Taunton MassHealth Enrollment Center and the MassHealth Estate Recovery Unit. Additional supporting data and documentation were provided by administrative units within the Office of MassHealth -- the Policy and Implementation Unit, Information Systems, Publications, and the Division of Specialty Programs. Federal law on recoveries from liens and estate recovery, originally mandated in the Omnibus Reconciliation Act of 1993 (OBRA 93) is in Section 1917(b) at:: http://www.ssa.gov/OP_Home/ssact/title19/1917.htm. Massachusetts regulations for estate recovery are given in 130CMR 515.011 at: http://www.mass.gov/Eeohhs2/docs/masshealth/regs_member/regs_memb_515.pdf. Currently, claims for the state pharmacy program and home health expenses are not counted towards the total claim amount. The home health exception is only for dual eligibles and only for dates of service through September 30, 2004 unless an extension for this demonstration is authorized by the Centers for Medicare and Medicaid Services (CMS). Massachusetts regulations in 130CMR 515.011(D) waive estate recovery due to hardship for persons owning an interest in a property and residing in that property continuously for at least a year immediately before the now-deceased member became eligible for MassHealth. Such persons income must be at or below 133% of the Federal-poverty-level (FPL). If persons meet all of these requirements for a 2-year period after the members death, recovery is permanently waived. The requirements are given in 211 CMR 65.09(1)(e)(2) of the Massachusetts Division of Insurance regulations at: http://www.mass.gov/doi/Legal_Hearings/211_65.PDF. The policy must pay a minimum of $125 per day for at least 730 days in a nursing facility licensed by the Massachusetts Department of Public Health and may not have an elimination period (days before which payment is made) longer than 365 days. Federal law on the imposition of liens, originally enacted in TEFRA 1982, is in Section 1917(a) of the Social Act at: http://www.ssa.gov/OP_Home/ssact/title19/1917.htm. Federal administrative guidance to states is in the State Medicaid Manual, Chapter 3, section 3810 A. 1. and F. at: http://www.cms.hhs.gov/manuals/45_smm/sm_03_3_3800_to_3812.asp#_3810. Massachusetts regulations for real estate liens are given in 130 CMR 515.012 at: http://www.mass.gov/Eeohhs2/docs/masshealth/regs_member/regs_memb_515.pdf. Although state regulations allow liens to be placed on property not used as the home, it would be rare to establish Medicaid eligibility for such a person since that property would be considered a countable asset. Before placing a lien on a life estate, eligibility workers must first establish that its creation did not violate transfer of assets rules. Massachusetts regulations on exceptions to placement of a living lien are given in 130CMR 515.012(A) at: http://www.mass.gov/Eeohhs2/docs/masshealth/regs_member/regs_memb_515.pdf. The living lien deferral differs from the deferral for estate recovery. It applies to a sibling who does not have a legal interest in the property but lived in the property for at least 1 year prior to the member's institutionalization or an adult child who lived in the property for at least 2 years prior to the member's institutionalization and provided care allowing the member to live at home. All Medicaid applications for the under 65, non-institutionalized population are processed by staff at a fifth office, the Central Processing Unit. Massachusetts has two application packages. The first is used for non-institutionalized persons under age 65 whose eligibility is based on rules contained in an 1115 demonstration waiver. The second is for persons 65 and older who are living at home or persons of any age who need long-term care services. Both packages contain an application that must be completed by all applicants. In addition, each package contains supplements that may or may not have to be completed, depending on the applicants circumstances. Institutionalized persons and persons applying for home- and community-based waiver services must complete the Long-Term-Care Supplement. Applicants may call a centralized Customer Service Center to request an application package by mail. Packages are also available at hospitals and a number of community service sites, or may be downloaded from the MassHealth website. See Application for Seniors and People Needing Long-Term-Care Services, MassHealth Long-Term-Care Supplement, and MassHealth and You: A guide for seniors and for persons of any age needing long-term-care services at: http://www.mass.gov/Eelders/docs/MHA-app(04-03).pdf, http://www.mass.gov/Eeohhs2/docs/masshealth/appforms/ltc_supplement.pdf, and http://www.mass.gov/Eeohhs2/docs/masshealth/appforms/mh_you_guide.pdf, respectively. There is no income cap in Massachusetts, and institutionalized persons are able to retain a $60/month personal needs allowance in addition to other federally mandated allowances. The institutionalized person may retain $2000 in countable assets and the at-home spouse may retain half of the couple's countable assets up to the current Fedearl maximum of $92,760. See Massachusetts regulations at 130CMR 520.016 for personal needs and other deductions and 130CMR 520.005(A) and 520.016(B)(2) for asset allowances at: http://www.mass.gov/Eeohhs2/docs/masshealth/regs_member/regs_memb_520.pdf. Massachusetts does not have a face-to-face interview requirement, so the vast majority of applications are submitted by mail. Intake workers attribute this to one or both of the following: 1) the fact that there are only four regional Enrollment Centers in the State, which necessitates a lengthy commute for many, and 2) most applicants have already received information about Medicaid eligibility requirements and the MassHealth application process from a hospital social worker, community advocate, Medicaid consultant, or attorney. This advice, along with the information contained in the MassHealth booklet and accessibility to intake workers by phone, gives the applicant sufficient information to apply for Medicaid by mail and eliminates the need to travel to an office to apply in person. Anecdotal information from intake workers indicates that their perception of their job description is to determine an applicants eligibility for MassHealth, not to advise applicants on how to circumvent estate recovery. They will, however, explain the transfer rules and regulations to persons who ask about them. The Long-Term-Care Supplement asks if the applicant intends to return home and explains that the home will be treated as a countable asset if he or she does not intend to return home. If the question is not answered, the applicant is asked to fill out a Statement of Intent to Return Home (Appendix), which again asks about the applicants intent. According to eligibility workers, some applicants owning homes and not having at-home spouses indicate they have no intention of returning home and prefer to sell the home rather than retain and maintain it. This is attributed to the burden imposed on adult children who must use their own money for taxes, insurance, utilities, and home maintenance. See the Agreement to Sell Property in the Appendix. See the Statement of Expectation to Return Home in the Appendix. See the Notice of Intent to Place a Lien in the Appendix. Workers state that such appeals are infrequent and that the applicants representative usually does not dispute that the member has no expectation to return home. Usually they are contending that a previously unreported relative (who would exempt the property from the lien) is living in that property. See The MassHealth Lien in the Appendix. The Estate Recovery Unit is currently staffed by 23 people, all of whom are public employees (i.e., not private contract staff). Three are managers, 12 are case specialists, and four are analysts. In addition, there is a lien coordinator, a finance administrator, an intake coordinator, and an administrative assistant. The case specialists are all attorneys or paralegals. In the past year, staff have attended seminars and taken courses offered by the Suffolk University Law School, Massachusetts Continuing Legal Education, and Professional Education Systems, Inc. In addition, they have attended seminars given by the National Academy of Elder Law Attorneys to become familiar with the advice currently being provided to the public by estate planning attorneys. There are 21 Registries of Deeds in Massachusetts. Data provided by the MassHealth Estate Recovery Unit. Data provided by the MassHealth Enrollment Centers. See MassHealth Lien in the Appendix. If a transfer has taken place, the Lien Coordinator will contact staff at the enrollment center to determine if they were aware of the transaction and, if not, will provide them with whatever information is available. An ongoing worker at the enrollment center will then contact the members family for information and/or re-determine the members eligibility. Data provided by the MassHealth Estate Recovery Unit for liens released in FY 2003 (July 1, 2002 to June 30, 2003). The home may be transferred without penalty to a caretaker child who was living in the property for at least 2 years prior to the members institutionalization or to any relative who would have exempted the home from the living lien requirement described above. See Status Change for a Member in a Long Term Care Facility or Rest Home in the Appendix. Exceptions include claims for the state pharmacy program and home health expenses for dual eligibles for dates of service through September 30, 2004 (unless an extension of the demonstration allowing this exception is authorized by CMS). The assessed value must be verified by a current tax bill or the most recent tax assessment issued by the taxing jurisdiction. General Laws of Massachusetts, Real and Personal Property and Domestic Relations, Title II, Chapter 198: Section 1 Order of payment of debts at: http://www.mass.gov/legis/laws/mgl/198-1.HTM. See Section 32(a) of Chapter 118E of the Massachusetts General Laws at: http://www.state.ma.us/legis/laws/mgl/118E-32.htm. See Notice of Claim Cover Letter in the Appendix. See Massachusetts regulations for waiver of estate recovery due to hardship in 130CMR 515.011(D) at: http://www.mass.gov/Eeohhs2/docs/masshealth/regs_member/regs_memb_515.pdf. General Laws of Massachusetts, Real and Personal Property and Domestic Relations, Title II, Chapter 198: Section 1. Order of payment of debts at: http://www.mass.gov/legis/laws/mgl/198-1.HTM. Generally mortgages, taxes, amounts due public utilities and child support arrears are paid before the Commonwealths claim. The living lien must be released upon request of the estate whether or not it is probated. Prior year amounts for the 50 states may be found at: http://www.cms.hhs.gov/medicaid/tpl/tplparta.pdf. In FY 2003, California recovered $39,335,161 and Ohio recovered $38,454,457. See the FY 2003 state-by-state summary of estate recoveries at: http://www.cms.hhs.gov/medicaid/tpl/tplpart1.pdf. Transfer of assets provisions may be found in section 1917(c) of the Social Security Act at: http://www.ssa.gov/OP_Home/ssact/title19/1917.htm. The Massachusetts House of Representatives currently has 137 Democrats, 22 Republicans, and one Independent. The Senate currently has 32 Democrats and eight Republicans. See the General Laws of Massachusetts, Part 1, Title XVII, Chapter 118E -- as amended by 2003, 26, Sec. 330 effective July 1, 2003 applicable to individuals dying on or after July 1, 2003 at: http://www.mass.gov/legis/laws/mgl/118e-32.htm. Non-probate assets include real and personal property that would pass to a survivor, heir or assignee through joint tenancy, tenancy by the entirety, life estate, living trust, right of survivorship, or beneficiary designation. Massachusetts law prohibits placing a lien or any kind of attachment on the property of a MassHealth member while the spouse is still alive. The spouse is then free to sell the property, transfer its title, or amend the ownership in any way, including refinancing, except in rare circumstances where the property was owned solely by the deceased member and passed through probate in whole or in part to person(s) other than the spouse. Outside sections 167 and 168 of the FY2005 budget amend the Massachusetts General Laws to restrict recovery to probate estates only. The amendments may be found at: http://www.mass.gov/legis/05budget/outside_sections.htm. Section 1115 of the Social Security Act allows the Secretary of Health and Human Services to authorize state demonstration projects that change the Medicaid rules under which eligibility is established. A description of the waiver process and intent may be found at the Center for Medicare and Medicaid Services (CMS) website at: http://www.cms.hhs.gov/medicaid/waivers/default.asp. See the full text of the waiver proposal at: http://www.cms.hhs.gov/medicaid/1115/matoawp.pdf.